TBS delivers 34th consecutive Quarterly Claritas Update. More Usability and Dashboard Updates on the way. an option to add Inactive Projects to the Multi-Project Forecast View for quick historical look-ups. In response to rising customer demand, TBS continues to steadily enhance Claritas Forecasting to deliver a cost-effective and easy-to-use project planning tool. Lauded for its powerful and approachable project reporting, Claritas is available to organizations hosting GCS Premier, Costpoint and QuickBooks in the ITAR-, FAR52- and NIST800-compliant TBS Cloud. “In an era of uncertainty with legacy GovCon ERPs and rising software costs, Claritas and the TBS Cloud continue to deliver high-value quarterly functional enhancements like clock-work,” say TBS Co-Founders Jay Ethridge and Joe Jezior. TBS apps are designed to solve the most stubborn challenges facing project-based businesses – timely Project Reporting with Claritas, streamlined Accounts Payable processing with AutoMate A/P, mobile Project Collaboration with SkyVault, and automated Data Connections with I.C.E (Integrated Cloud Exchange). An original Deltek founder and co-author of System 1, the first commercially available accounting software for government contractors, Mr. Brown led the development of Costpoint, GCS and Vision while at Deltek for 20+ years. To learn more about the Claritas Q1 update or to schedule your Claritas Demo, email Claritas@TBS-llc.com or call 703.444.6562 x1. With Claritas, Project Managers and Financial Analysts build their Project Forecasts at either the Contract or Task level. Claritas Forecasts include monthly Project Employee Hours by Labor Category and Account, as well as Monthly Project ODCs, for a complete forecast year by year, all on one screen. Personnel managers may also build monthly Workforce Forecasts for both full- and part-time Employees and Subcontractors for current and future fiscal years. 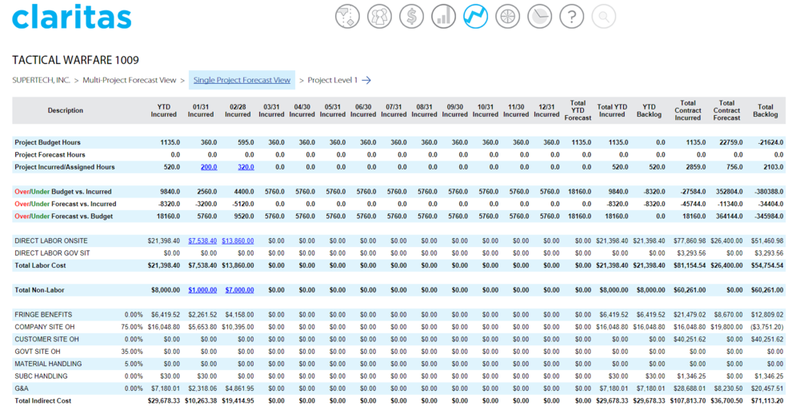 The heart of Claritas Forecasting is the Single Project Forecast View, which captures a Project's entire fiscal year – with real-time performance comparisons for budgeted scenarios, incurred labor and expenses, and on-going forecasts – on a single screen. For past periods, PMs click into Labor, ODCs and Indirect Expenses to see monthly cost details. Current period cost reports include daily unposted and unprocessed labor and expenses from in-progress Time-Ade or Time Collection timesheets not yet approved. PMs and Analysts also forecast their Targeted Indirect Rates, enabling them to project future impacts from Fringe, Overhead and G&A changes on their comprehensive annual project plans. Claritas Q4 Update adds Actual vs. Budget comparisons for Cost-Plus Contracts.